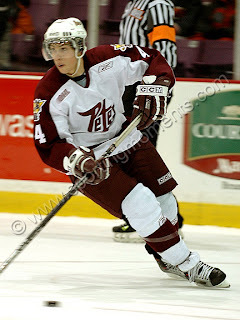 Zach Bogosian, sophomore defenceman with the Peterborough Petes, isn't the only Bogosian being recognized recently. Zach has been ranked 3rd overall by NHL Scouting in advance of the upcoming NHL draft in June. His older brother Aaron is a freshman at St. Lawrence University and was name ECAC Rookie of the Week last week. Jan. 7: St. Lawrence University freshman center Aaron Bogosian has been selected as ECAC Hockey Rookie of the Week for the second time this season after helping the Saints to a 6-5 upset of 7 th-ranked New Hampshire on Sunday. Bogosian had a goal and set up the game-tying goal as the Saints came from down 5-3 in the third period to win with three goals in the last 7:06 of regulation. The Saint rookie from Massena, who played junior hockey at Cedar Rapids last season, has scored a goal in each of his last three games and has scored six of his eight points on the season in his last three starts. Bogosian, who has played in all 19 games thus far for the Saints, was also named Rookie of the Week after a Saint split at Ohio State in early December. Interesting...I didn't know about the elder Bogosian... I missed St. Lawrence's game aganst UVM in Dec., so I missed my chance at catching a game of theirs!